Adds variety to enemy werewolf encounters. 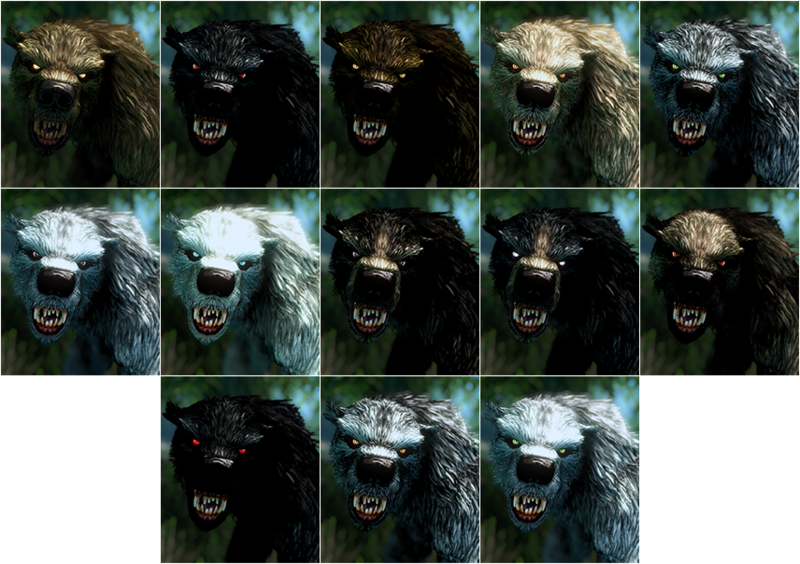 There are now 25 werewolves and 13 werebears, each leveled at 11 possible ranks for a total of 418 new enemies. NPC werewolves also have custom skins. All assets contained in this file are created by other authors. spwned/Brevi - Resources were originally collected and organized by Brevi in his file, Moonlight Tales. Some plugin data from MTSE was used also. NsJones - Heart of the Beast skin and eye textures. 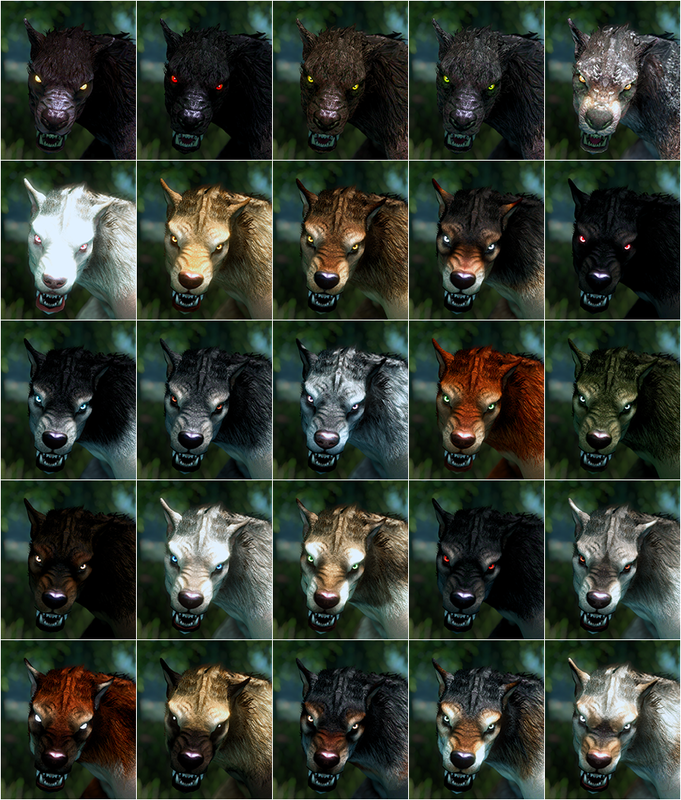 KrittaKitty - HD Werewolves skin and eye textures. Fiszi - Big Bad Wolves Skin Pack. KnErBSE73 - FURTASTIC werebear textures. Jeremy Hamilton / artifex0 - Natural werewolf skin texture. Werebears: Torkild, Snowclad Ruins Werebears, and the 3 randomly spawning Werebears on Solstheim. The record changes for these NPCs are as minimal as possible, to maximize compatibility. In some cases the changes are on associated quests, since that is what controls the transformations. NOTE: To get the custom skins for all NPCs, start a new save after installing DWC. It's perfectly safe to install DWC later, but depending on your progress some NPCs will use the default skin. Each of these now comes in a male and female variant as well, but you won't notice the difference unless you use a female werewolf body mod (see Compatibility section). The stats of these enemies are unaltered, only their skins have changed. 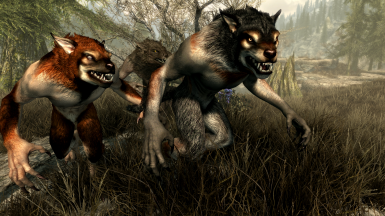 They will inherit any werewolf stat changes made by other mods. The only vanilla records overwritten for these are the LCharWerewolf and LCharWerewolfBoss leveled lists. 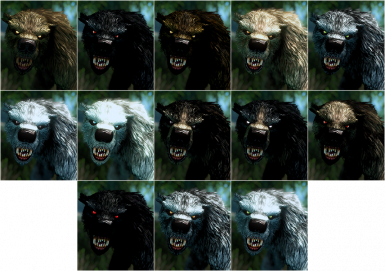 Each of the above randomized werewolf enemies also has a Werebear counterpart. These are incorporated into the same leveled lists as the werewolves, appearing about 1/3rd of the time. 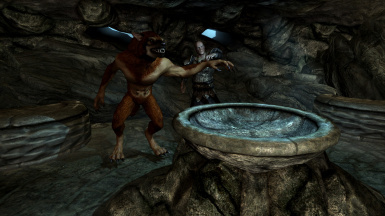 The lore actually says that Werebears are supposed to be the most common Lycanthrope in Skyrim but I didn't want to go that far. The werebears also have randomized skins. Werebears also come in male and female variants, but there aren't any female werebear mods that I know of so it's really just for posterity. 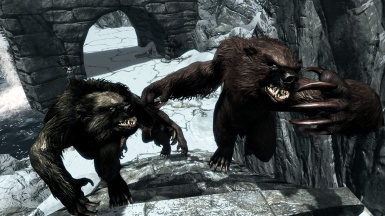 Werebears have higher health and stamina, stronger power attacks, weaker perks, etc, consistent with vanilla. The exact values were determined by my personal judgment with an attempt at balance, since Dragonborn only added Werebears at level 25. The werewolf corpses and spiked heads in and around Silver Hand camps have randomized skins also. 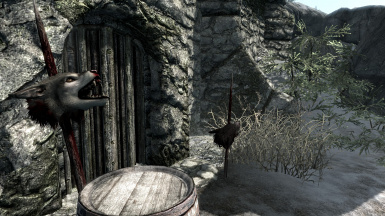 These will not change on each playthrough, unlike the enemies -- the static objects were randomly replaced in TES5Edit, not chosen at runtime. 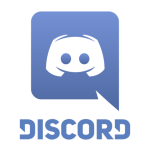 This mod contains no scripts. When do I see enemy werewolves anyway? 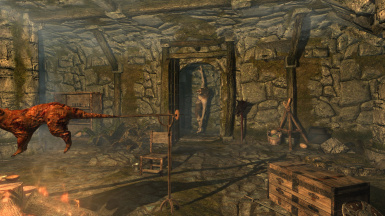 In vanilla Skyrim, there are the NPCs you see listed in Detailed Contents, the caged werewolves found in Silver Hand camps, and a couple of rare wild encounter events added by Dawnguard. 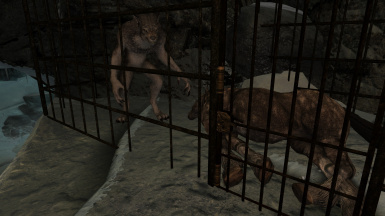 I highly recommend pairing this mod with More Werewolves or a similar mod, which will allow you to encounter more enemy werewolves. 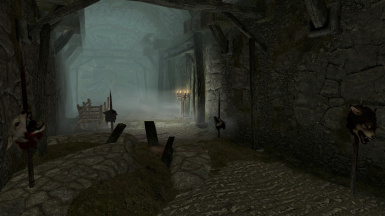 Install the mod (with mod manager, or drag files into Skyrim/Data) and enable it. To test, type "player.placeatme 1e791" into the console to spawn a random werewolf/werebear. If you have any other mods that edit the leveled lists for enemy werewolves, make a Bashed Patch for full compatibility, or otherwise make sure DWC is loaded after them. This is fully compatible with More Werewolves as well as Moonlight Tales Special Edition. DWC now supports female werewolf body replacers, assuming that their meshes have preserved the original order of body parts. However, you only need the meshes from those files and not the plugins, since DWC distributes these female skins itself. Note that it IS NOT currently compatible with La Femme Lycana, which changes the body part order resulting in bad retexturing. I have notified the author. If your mod also provides FemaleBodyWerewolf_0.nif, you can copy that as well for automatic weight slider incorporation. However, I'm not sure if werewolves have varying weights anyway. You could choose to use the _0 file instead of the _1 file by just renaming it, if you like it better. 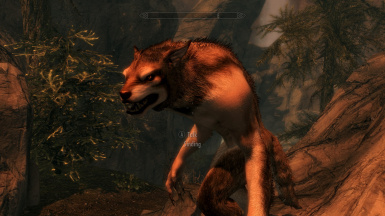 Any werewolf body can be used as the female werewolf by renaming it and putting it there, so long as it is compatible with plugin-based texture replacements.